The Metatarsal Protection Style 917 boot features fire-resistant Kevlar stitching, a water-resistant leather upper and a wide-fitting steel-toe cap. 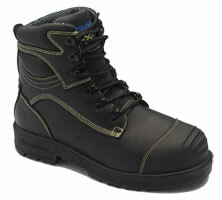 Poron XRD provides extreme impact protection with a molded pad stretching from the tongue to the steel-toe cap. The contoured, breathable and flexible boot also has a rubber sole that is heat-resistant to 572° F.
The Extremes 10-inch Pac Boot features a brown, oil-tanned leather upper. It has abrasion-resistant OrthoLite insoles with a multi-fit EVA filler unit that ensures a proper and comfortable fit. 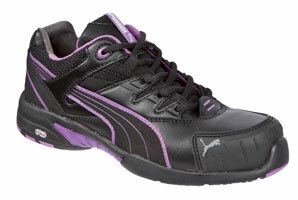 The molded TPU heel guard and rubber toe protects the wearer front to back. 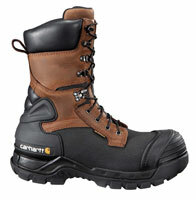 This boot is equivalent to 1,000 grams of insulation, without the weight and bulk. The Diamond Grip traction device attaches dozens of alloy steel grippers to the bottom of a shoe or boot. The patented six-pointed “diamond beads” are strung on steel aircraft cable. They put hundreds of biting edges under the heel and ball of the foot to grip the slickest ice, hardest-packed snow, and even rock or gravel. Metatarsal injuries are painful and can require a long recovery process. MetGuard is a shield-like overlay that offers complete armor-like protection to absorb impact so the feet do not. MetGuard with Poron XRD impact-absorbing technology meets or exceeds ASTM F2413 standards for impact protection. 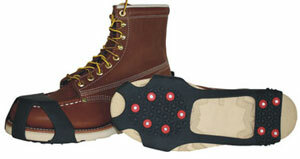 These ice and snow traction aids are lightweight and help prevent slip-and-fall incidents on ice and snow. They help give workers the confidence to work in otherwise perilous conditions. 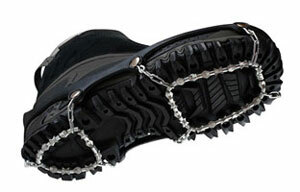 The traction aids feature replaceable tungsten carbide spikes that provide superior traction. 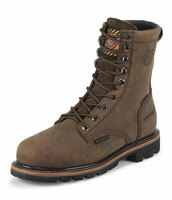 Sizes and styles are available to fit shoes and boots from size 4 to 14. 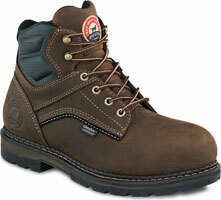 Available in 6- and 8-inch lace-up boots, pull-ons and loggers, the Irish Setter Work line comes in 29 styles with features such as soft toe and steel or aluminum safety toe styles; Goodyear welt, direct attach or cement construction options; UltraDryTM waterproofing; Thinsulate insulation; and CuShin Comfort Tongue padding. 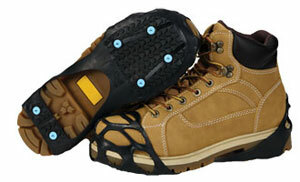 The Miss Safety line of performance safety footwear with a steel-toe cap is designed exclusively for female feet. Features include a gel pad built into the heel area, shock absorption and the ability to resist heat up to 572° F. An ultra-light EVA midsole injected with billions of tiny bubbles ensures optimal cushioning. The Winter-Tuff Ice Traction Spikes Style 1150 features 20 carbon-steel studs that dig into slippery surfaces to help keep workers safe. The high-stretch rubber formulation and full-fitting design provide a great fit and make the spikes easy to put on and take off. They fit a variety of footwear styles for both men and women.